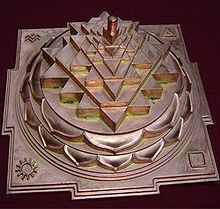 The Sri Yantra (shown here in the three-dimensional projection known as Sri Meru Chakra or Maha Meru used mainly in rituals of the Srividya Shakta sects) is central to most Tantric forms of Shaktism. Śrī Vidyā (also spelled "Shri" or "Shree" Vidya. विद्या (IAST: vidyā) is "knowledge, learning, lore, science".) is a Hindu Tantric religious system devoted to the Goddess as Lalitā Tripurasundarī ("Beautiful Goddess of the Three Cities"), Bhuvaneshvari, etc. A thousand names for this form of Devī are recited in the Lalitā Sahasranāma, which includes Śrī Vidyā concepts. The sect accepts and aims to provide both material prosperity and self-realisation. It has an extensive literature. Details of belief vary in different texts but the general principles are similar to those found in Kashmir Shaivism. In the principally Shakta theology of Śrī Vidyā the goddess is supreme, transcending the cosmos that is her manifestation. She is worshiped in the form of a mystical diagram (Sanskrit: yantra), a central focus and ritual object composed of nine intersecting triangles, called the Sri Yantra or śrīcakra The Meru Chakra is a three-dimensional form of this, made of rock crystal or metal, often a traditional alloy of silver, antimony, copper, zinc and pewter that is held to enhance the flow and generation of its beneficial energies, covered in gold. Mantras are believed to reveal the unity of the deity, the guru and initiate and the mantra or sound syllable Itself. The first mantra given to initiates is the Bala TripurasundariMantra. Here the Goddess is visualized as a small child. The next level mantra is the fifteen-lettered Panchadasi or Panchadasakshari Mantra. A higher mantra is the sixteen-lettered Shodasi or Shodashakshari Mantra. ^ Apte 1965, p. 857. ^ For influence on the Lalitā Sahasranāma and a brief summary of some Śrī Vidyā practices see: Sastry 1986, pp. vii-ix. ^ Bhattacharyya 1999, p. 329. ^ Flood 1996, p. 188. ^ For goddess as supreme and beyond the manifest cosmos, see: Flood 1996, p. 188. ^ Flood 1996, pp. 187–188.